The Bharatiya Janata Party today elected former Deputy Prime Minister L.K. 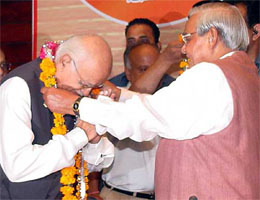 Advani as the Leader of the Opposition in the Lok Sabha and choose former Prime Minister Atal Bihari Vajpayee as the Chairman of its parliamentary party. Former Deputy Prime Minister L. K. Advani is greeted by former Prime Minister Atal Bihari Vajpayee after he was elected Leader of the Opposition in the Lok Sabha at a BJP Parliamentary Party meeting in New Delhi on Tuesday. The USA seems to have adopted a wait and watch policy in the field of defence policy with India, specially waiting for the new government to work out extent of finer details of New Delhi’s strategic relations with Washington. The UPA government has accepted the resignation of Attorney-General Soli J. Sorabjee, who was appointed to the post by the NDA government, official sources said here today. The government has initiated the process for appointing his successor. Coal Minister Sibu Soren’s sudden announcement of shifting the Coal India Limited headquarters from Kolkata to Ranchi and his simultaneous demand of removal of the DVC and Hindustan Copper’s main office from the city to Jharkhand’s capital, brought once again Trinamool Congress chief Mamata Banerjee in the forefront in her usual fighting mood. Four persons, including a Subedar of Assam Rifles and a relative of a state minister, were killed in insurgency-related incidents in Manipur since yesterday, official sources said today. Police commandos, acting on a tip-off, rushed to the Hiyangthang area, about 25 km west of here, and surrounded a suspected hideout of militants in the wee hours today. 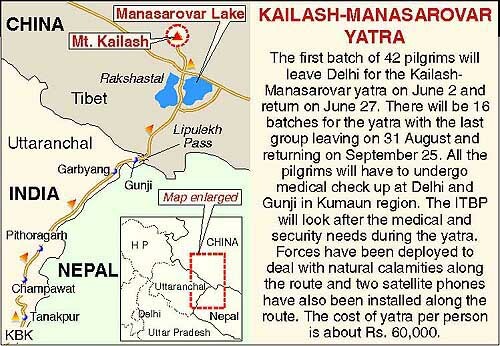 At least 20 persons have died of diarrhoea, measles and gastroenteritis and 600 others have been taken ill in over 10 villages of the district during the past fortnight, Health Department sources said here today. After lying latent for about a week, monsoon today covered some more parts of the country as the weather department predicted some respite from sweltering conditions for North India. Army chief says 4,000 rebels ready to move into Kashmir. Winner in spite of all odds. 77-year-old Advani was unanimously elected at a meeting of the BJP Parliamentary Party, the first after the rout the party suffered in the Lok Sabha elections. Mr Advani thus returns to his favourite turf of the Opposition benches after a gap of about 9 years. He had occupied the post of Leader of the Opposition from 1991 till he resigned from the Lok Sabha in the wake of his being named in the Hawala scandal. He was later discharged in the case. Giving him the status of a “senior statesman”, Mr Vajpayee was elected Chairman of the BJP Parliamentary Party after the party constitution was amended, as the Congress did last week to enable Mrs Sonia Gandhi to be made Chairperson of the Congress Parliamentary Party. The BJP MPs also elected former Finance Minister Jaswant Singh as Deputy Leader of the Parliamentary Party and Leader in Rajya Sabha that would make him the Leader of the Opposition in the Upper House. The two-hour long meeting, which was addressed by Mr Vajpayee and Mr Advani, focused on the reasons behind the party’s defeat in the polls. Mr Vajpayee also attributed the debacle to “complacency” while Mr Advani asked MPs to be vigilant and play the role of a constructive opposition. Stressing that the party would come back, Mr Vajpayee said at the first meeting of the party MPs after the polls was to introspect why the party did not get a renewed mandate despite the achievements of the NDA government, being in a favourable situation and tremendous enthusiasm among its cadre. Later, Mr Vajpayee told newspersons that “complacency” and “overconfidence” could be among the causes for the debacle but ruled out Gujarat violence had anything to do with it. “Defeat is an issue for which reasons would have to be found though it has no link to violence,” he said replying to a question whether violence in Gujarat was one of the causes for the debacle. Mr Vajpayee said another factor responsible for the setback was “failure to identify the rival”. Virtually asking party MPs to be ready for early elections, he said while the BJP was ready to sit in Opposition for five years, it needed to be seen whether the UPA would allow it to do so. Mr Naidu proposed Mr Vajpayee’s name for the chairmanship of BJP Parliamentary Party. The party President proposed the amendment to the party’s constitution, which would be approved at the party’s National Executive slated to meet here on June 11 and 12. The Congress-led UPA Government got support from unexpected quarters today with one of the Sangh Parivar outfits, Swadeshi Jagran Manch, today welcoming the common minimum programme (CMP) and accused the BJP-led NDA of having “lost touch with the masses”. “Despite registering achievements like rise in exports and forex reserves, control over inflation, infrastructure development, particularly roads and telecom, etc. and also successfully protecting national interests at the World Trade Organisation (WTO), the NDA government failed to win back the support of the people who really matter,” national convener of the manch Muralidhar Rao said here. “The new coalition has attempted to reflect the aspirations of common man and balance the growth imperatives. The CMP appears to disseminate the message that the government is serious about welfare of farmers, artisans, workers and weaker sections of society,” he said. With the new government in place at the Centre, the USA while renewing its offer to India to move ahead on cooperation in joint development of hi-tech weapons system, including missile defence shield, today said that it understood that the new government was in place and that it should assess “where we are and whether we need to move forward”. Mr Douglas J. Feith, the visiting US Under Secretary of Defence for Policy told newsmen here after the first day of the three-day Indo-US Defence Policy Group (DPG) meeting that “ India is going to make its own decisions. We have made that clear and we are going to be hopeful”. The meeting which began here is very crucial for the Indo-US defence relations as some of the allies in the Congress-led United progressive Alliance (UPA) government have expressed their reservations to the increased closeness between India and the USA. Reacting to a question that the previous government was more maenable to the USA and its policies, the US Under Secretary said that the USA wanted to carry forward the understanding reached between President Bush and the then Prime Minister A.B. Vajpayee to move ahead in the important initiative of cooperation on the defence missile shield. “We discussed the issue with new Indian leadership as both the countries are facing serious missile threats and if New Delhi wants to go ahead with cooperation on missile defence, we can be helpful”, Mr Feith, who is also the co-chairman of the Indo-US DPG, said. The Indian delegation at the DPG meeting is being led by Defence Secretary Ajay Prasad. The US Under Secretary for Defence later also called on the Defence Minister Pranab Mukherjee. On the earlier US demand for India to deploy its troops in Iraq, the US official said that the matter did not figure in the talks and reitirated Secretary of State Colin Powell’s remarks that it was for the new Iraqi authority to take a decision on whom to invite for security and reconstruction work. He said that joint exercises and engagements betwen all the major services of the two countries including Army, Navy and the Air Force and Marines figured prominently in the talks. Senior advocates Milon Banerjee and K. Parasaran, who had held the post earlier also, are being considered as front runners. The government has also accepted the resignations of Solicitor-General Kirit N. Raval and over half-a-dozen Additional Solicitors-General appointed by the previous government, the sources said. Law Minister H.R. Bharadwaj has begun the exercise to choose the new Attorney-General and the Solicitor-General. It is a set convention that law officers appointed by a government tender their resignation on its defeat in the election. This enables the new government to appoint the law officers of its choice to advise it on legal matters and represent it in the Supreme Court and the high courts. For the past two days she organised dharna in front the headquarters of the CIL and the DVC and last night before leaving for New Delhi she asked her workers and supporters to continue the agitation till she returns. Ms Banerjee said she would meet Prime Minister Manmohan Singh, if possible, to protest against the proposed shifting of the CIL, the DVC and other Central Government offices from Kolkata to other states. She will also meet Mr A.B. Vajpayee and other NDA leaders to discuss their future political strategy against the new Congress-led coalition government at the Centre. The TMC alleged the Eastern Railway had been bifurcated against its will but now the party would not allow the shifting of the headquarters of the CIL and the DVC from Kolkata to Ranchi at the cost of the interests of Bengal people. Ms Banerjee already “ganged up” with Mr George Fernandes to make a move for fielding Mr P.A. Sangma, former Lok Sabha Speaker and now a TMC MP, against the UPA’s candidate for the Speaker’s post, Mr Somnath Chatterjee, in the election so that Mr Chatterjee did not get elected unopposed. Neither Mrs Sonia Gandhi nor the CPM central leadership had taken her move in a good light. Mrs Gandhi already suggested the NDA could be allowed to get the Deputy Speaker’s chair if there was no election for the Speaker’s post. Accordingly, Minister for Parliamentary Affairs Ghulam Nabi Azad met NDA convener Fernandes with the proposal but the response was quite lukewarm. Mr Azad will meet Mr Vajpayee and Mr L.K. Advani with the proposal. NDA circles said Mr Fernandes and other leaders were annoyed that the Congress was again reviving the Tehelka issue and other alleged malpractices as personal vendetta against the ministers of the previous government. Ms Banerjee, however, is aggrieved that the Congress has packed with CPM leaders against the TMC and the BJP in Bengal to crush these parties. She reiterated that the TMC would once again come in the forefront in Bengal with the people’s support against the CPM. But incidentally the CPM as well as the Congress jointly protested against any move for shifting the headquarters of the CIL, the DVC, etc. from Kolkata. 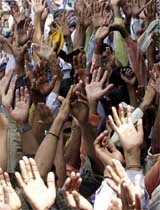 Chief Minister Buddhadeb Bhattacharjee has already sent a protest note to the Prime Minister in this regards. CPM Politburo leader Sitaram Yechuri said they would not allow any such move to materialise. As the commandos were fired upon, they retaliated and in the ensuing encounter, one suspected militant was killed and several others escaped under the cover of darkness, they said. In another incident, a Naik Subedar of 37th Assam Rifles was shot dead from point blank range by suspected militants at the border town of Moreh, about 120 km south-east of here, in state’s Chandel district yesterday, the sources said. Meanwhile, Ph Sanajit, a relative of Manipur Food and Civil Supplies Minister Ph Parjit, was killed in an ‘encounter’ with troops of 19 Rajput Rifles at the Khurkhul area in Sekmai police station in Imphal West district yesterday. However, the minister and family members alleged Sanajit, who was father of two children, had been forcibly taken out from home by the security forces and his body was later recovered from the Khurkhul area. Five persons, including four children, have died in Pure Sukhdev village and five others in Phalamai, the sources said, adding that Puri Chenni Khair village was the worst-affected where 10 persons had died and about 450 had been taken ill.
Several cases had also been reported from Babhanmai, Pure Sukhdev and Bharatpur villages, the sources said. “Monsoon advanced into the remaining parts of coastal Karnataka and sub-Himalayan West Bengal and Sikkim,” B.P. Yadav, Director at the Indian Meteorological Department said. “Monsoon had not advanced since May 23,” he said. The monsoon, which broke over India on May 18, ahead of its normal date of around June 1, was still three-four days ahead of schedule, he said.